I am just horrified how, even now in 2012, I visit schools and see designs that are frankly idiotic. Recently I visited a primary school undergoing some significant refurbishment. I was appalled to see a room being created within a larger space, but resulting in walls being built stopping just short of a large full length window. The result is a long narrow gap, not much more than twelve inches wide for the full width of the glass. From outside you will see a wall. 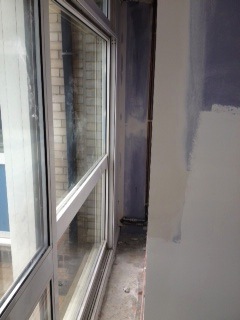 From inside - it will become a narrow little space which will attract litter or become a dumping ground. We all know it will. Why would anyone design this? Even worse - why didn't someone challenge it before they started construction? This is what I do a lot of the time for a range of companies - it really saddens me when I see someone get it all sooo wrong! It is the worst space I have seen for ages - some one should get in real trouble for this! It's shocking.